In principle, measurement of dissolved oxygen levels requires calibration and stirring the sample water during measurement, and measurements are affected by the salt concentration, temperature, and atmospheric pressure. The solution containing no DO (solution 1) is used for calibration as the excessive amount of sodium sulfite reacts with DO and completely removes it. Prepare the air saturated solution (solution 2) by bubbling pure water with air in a small container using a small pump (aquarium pumps, etc. may be used) for two to ten minutes. Prepare the pure oxygen saturated solution (solution 3) by bubbling pure water in a small container with a pure oxygen cylinder for two to ten minutes. When bubbling with pure oxygen, do not allow fire in the area. Generally, solution 1 is used for zero calibration, and solution 2 or pure water exposed to the atmosphere is used for DO saturation calibration. In principle, calibration and measurement of DO in a sample solution should be performed at a constant temperature (for example, at 25ºC). In order to allow DO in a sample solution to come in contact with the diaphragm of the DO sensor at a constant rate, the sample solution must be stirred at a constant rate. In order to do this, a flow cell is sometimes used. For measurement in a laboratory, use a magnetic stirrer to stir the sample solution at a constant rate (at a rotation speed that does not form an eddy (500 to 1,000 rpm)). If use of a stirrer causes an increase in sample temperature, use a constant-temperature bath. For measurement in a field site, measure the DO level while moving the electrodes up and down at a constant speed (about 30 cm every 2 seconds). As mentioned above, the saturation level of dissolved oxygen is affected by the concentration of salt contained in the sample water, and the higher the concentration of salt is, the lower the saturation level of DO is. 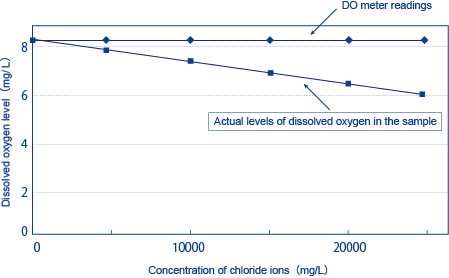 This can be seen clearly in Figure 1, which shows the relationship between the concentration of chloride ions (Cl-) and the saturation level of dissolved oxygen. However, the output of the diaphragm electrode method, whether it is the diaphragm galvanic electrode method or the diaphragm polarographic method (the term “diaphragm electrode method” refers to both methods) corresponds to the partial pressure of oxygen rather than the level of dissolved oxygen, and does not reflect the influence of the salt concentration. This means that you can calculate the salt concentration of the sample solution and correct (or reduce) the DO level accordingly based on the calculated value. Figure 1: Chloride Ion Concentration and Dissolved Oxygen Saturation at 25? The influence of temperature on the DO sensor for the diaphragm electrode method mainly comes from changes in the rate at which DO passes through the diaphragm. The higher the temperature becomes, the higher the rate at which DO passes through the diaphragm becomes and the higher the sensitivity of the DO sensor becomes. 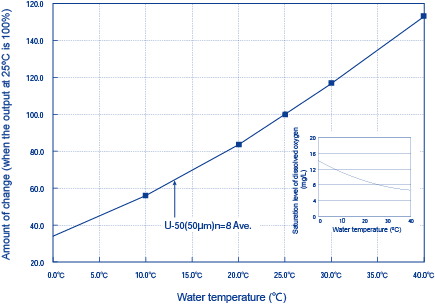 The influence of temperature on saturation levels of DO is as shown in Table 1 on the page “What Is Dissolved Oxygen?​​​​​​​” Aside from this influence, the influence of temperature on the DO sensor is considered here. Figure 2 shows the influence of temperature on the output of the DO sensor of our Multiparameter Water Quality Checker (model: U-50) (diaphragm polarographic method).